You have transformed into a Pokémon. Join forces with a partner to explore the randomly generated dungeons in this new land. 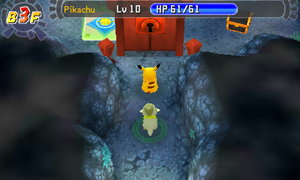 Starting out in Post Town, you must explore caves, recruit Pokémon partners and gather items before accepting more challenging missions. You can also build your own region by visiting the Pokémon Paradise, a derelict area that needs your help to spring back to life. You can activate Magnagates to special dungeons by pointing the Nintendo 3DS Camera at circular objects in the real world.